Young and Entertaining: Treat Yourself Tuesday! I’m a firm believer in Treat Yourself Tuesday…and Wednesday…Thursday.. You get the idea! Last night I had a reunion dinner with my two former roommates, Kelly and Stephanie. We lived together for years, in college and a few years after, and we used to love going to our favorite restaurant, Brasserie du Soleil, just for any occasion. My menu favorite is their Filet Bordelaise. It’s the perfect portion of Filet Mignon, in a rich and decadent red wine reduction, topped with a roasted shallot, and served with a paper cone of perfectly crisp pomme frites on the side. The best part is, no matter how full you are (I insist you eat every bite! 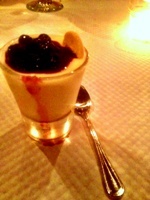 ), there is always room for one of their miniature desserts. Isn’t my cheesecake with blueberry compote darling? Tiny spoon included!